On Palm Sunday the church was full to overflowing with a congregation of more than 100, including many visitors. The Palm procession around the garden took place at the beginning of the service. 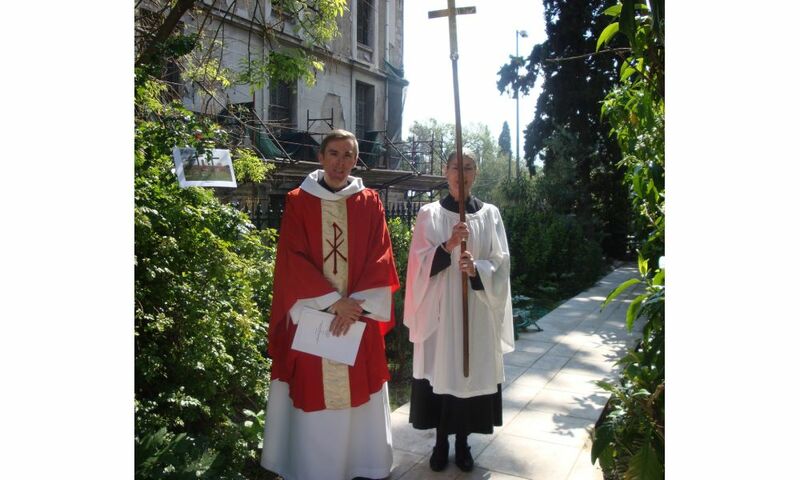 On Holy Wednesday the morning service was followed by another procession around the garden, this time to follow Christ’s journey along the Via Dolorosa to the site of His crucifixion. The Stations of the Cross offer a reflective and moving reminder of His suffering at the hands of captors and the comfort offered to Him by his Mother, by Veronica and Simon of Cyrene and finally by some unknown ‘women of Jerusalem’. This devotion is one of the many that take place during Holy week in all Catholic and in many Anglican, Lutheran and Methodist churches throughout the world. Nelly Paskevopoulou (far right) on the day of her confirmation. 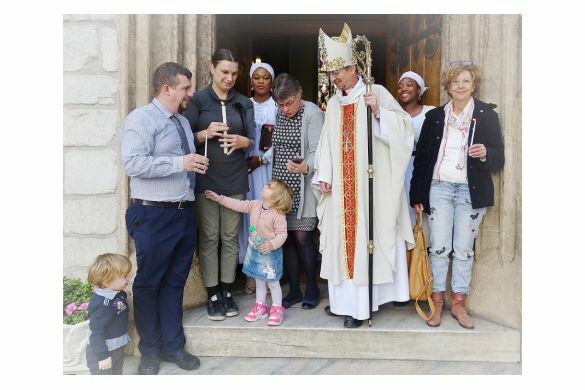 Last February Bishop Robert visited Athens to Baptize and Confirm members of our St Paul’s Congregation. 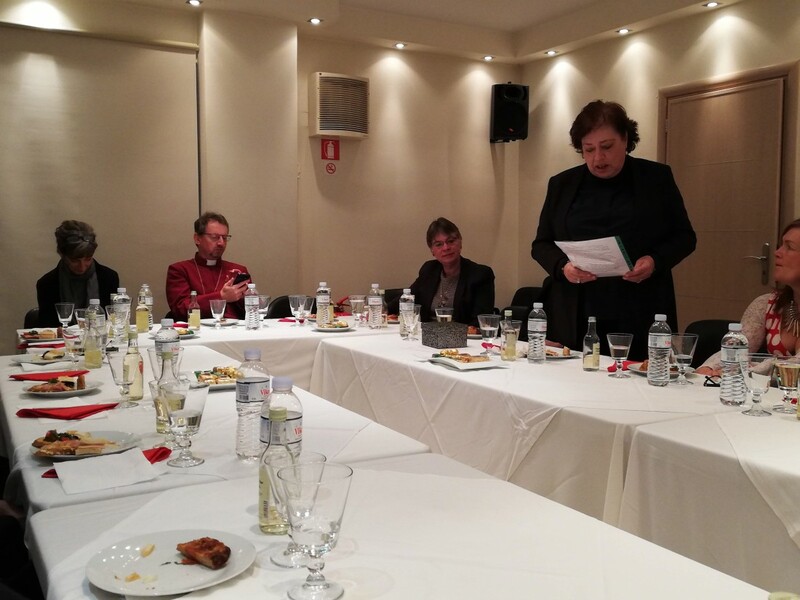 Here is the experience of one of the Candidates – Nelly Paskevopoulou. Spirituality and religion has always been my great passion. I grew up in a very religious family and faithfully attended Sunday School at the Evangelical church until my teens. Part of my education at home, by my half Scottish Grandmother, was learning Bible verses by heart and singing hymns before going to sleep at night. I loved Jesus with all my heart and prayed often to Him for all kinds of things. I knew for sure that He was listening. I admired saints, missionaries, nuns and priests. As a teenager all this changed and I followed other, more “materialistic” paths. 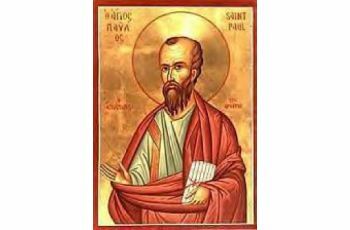 After many years of exploring almost every existing religious and spiritual path, from East to West and back again, my family tradition proved to be stronger and I “found my way back home”: to Saint Paul’s. It was the last Sunday of October 2017 when I decided finally to attend the service at the Anglican Church. I never expected to be so moved. I spent an hour crying from pure relief. Everything was familiar, but also completely new. Everything felt just right. Later on I asked Father Leonard for spiritual guidance and we had an illuminating discussion, which helped to clear my mind on religious matters. Since then I have done a lot of reading about Anglicanism and continue to feel that this is the right spiritual path for me. commit to all the other sessions. Blessed be God, Father, Son and Holy Spirit. Amen. Senior Chaplain of the Anglican Church in Greece; Apokrisiarios of the Archbishop of Canterbury to the Archbishop of Athens and All Greece; Canon Theologian of the Diocese of Cameroon. This short booklet is intended to help the reader to have a greater understanding of the richness of this season; its liturgies and practices; to give a brief overview, not a detailed and exhaustive history. The hope is that it will enhance your worship, and maybe explain a little more about why we do certain things. It certainly is intended to encourage the reader to engage with and experience as much of this season as possible. The whole season revolves around the mystery of Christ’s passion and resurrection, but there are liturgical ways in which we express this, and the booklet seeks to describe some of this. 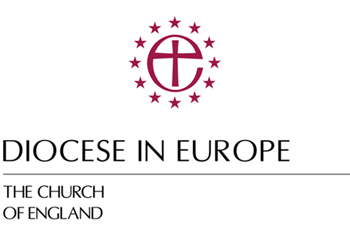 It is only in the last 50 or so years that the Church of England has been developing its liturgies for parish use. Up until Common Worship in the year 2000 the Book of Common Prayer determined official liturgical use. Those who were more exotic in their taste turned to Roman manuals for other material. 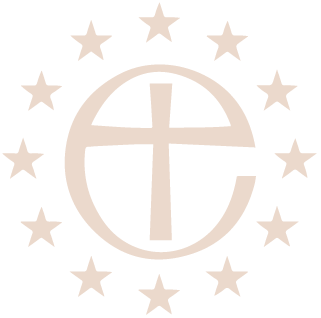 Rich in its language and much loved in English culture, nonetheless BCP was restricted – restricted by the very thing that makes it beautiful, namely its old English, but also by the efforts of the Reformation itself to eradicate certain practices that were unacceptable at the time. The Army chaplains of the First World War were the first to realize how inflexible the Prayer Book was as they ministered to dying men in the trenches of Northern Europe. 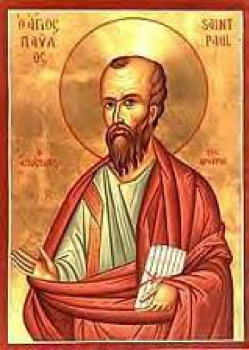 More contemporary language was needed; pastoral flexibility in extremis was desirable. 1928 saw the first real attempt to revise the book that had determined how the Church of England worshipped. This failed to get approval in Parliament. 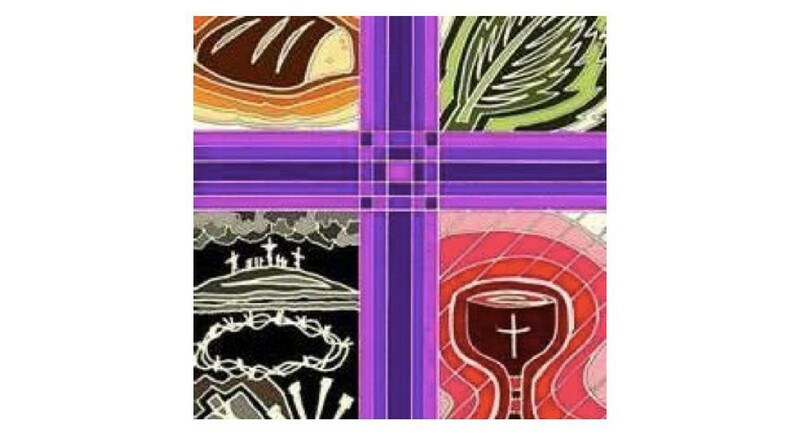 The 1950’s saw the Parish Communion movement emerge, and there was need for different ways to express both the shape and structure of our worship, and the finer details of liturgical seasons. With Vatican II coming along there was also greater co-operation between the Roman Catholic and Anglican (along with Methodists and URC) liturgical scholars, and the Church of England was becoming a more ‘liturgical beast’ wishing to rediscover things in the different seasons of the church’s year, especially the seasons that revolve most tightly around our Lord’s life, namely the Incarnation and the Resurrection (known better to us as Christmas and Easter). We were encouraged to think of seasons, or cycles, and not individual feasts. So there emerged the ‘incarnation cycle’ comprising Advent, Christmas, and Epiphany (with all its wonderful themes of manifestation of God’s glory in Jesus, unity, mission.) The other great cycle is that of the resurrection, including Lent, Holy Week, Easter, and the Great Fifty Days that embrace Ascension and Pentecost. 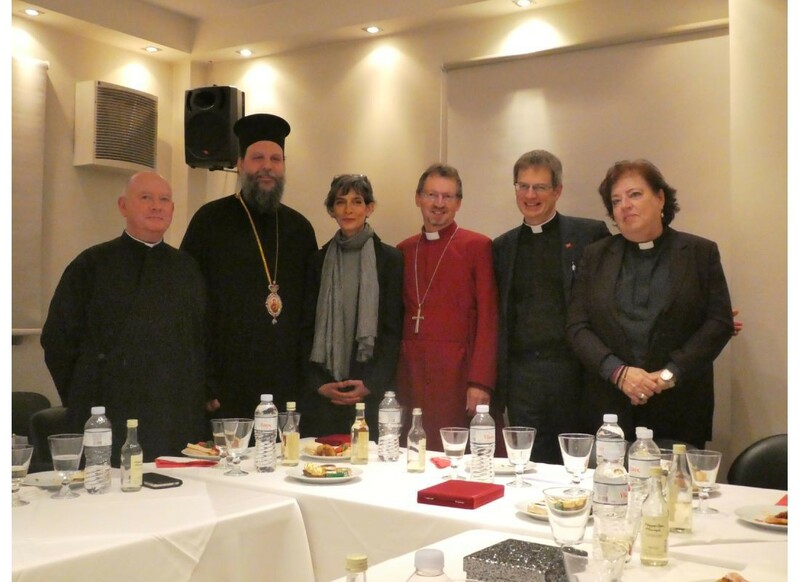 Ambassador, Bishop, Metropolitan Gavriel, long standing friends and colleagues here in Athens. As I look around the room it is indeed a great blessing to see you all here gathered for this event to celebrate all the worthy projects, partnerships and relationships that have been forged in Athens throughout the past few years since August 2015 when we here in Greece found ourselves suddenly thrown into the centre of a huge wave of migrating and displaced people washing up on our island shores before arriving in the port of Pireaus and moving on into this city’s squares. There have been many comings and goings since then – not as many legally entitled beneficiaries moving on to their destinations as quickly as we would like, poor conditions for those who stay and the trickle who leave always being replaced by others on the move. 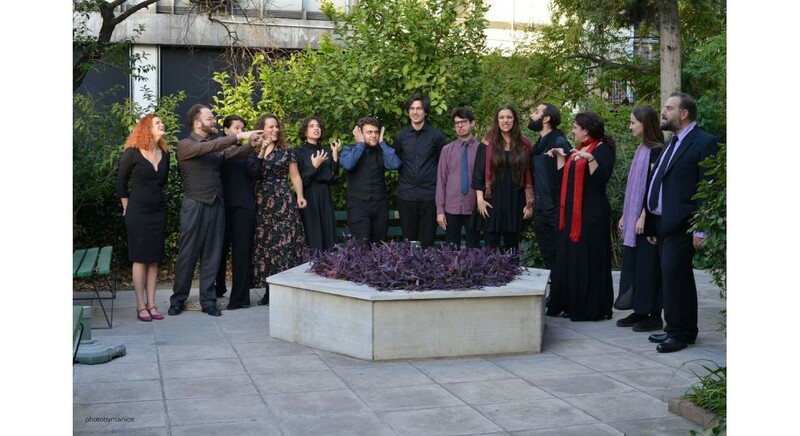 XXIII (23rd) Choral Evensong at St. Paul’s Anglican Church on Sunday, February 17th, 6:30-7:30 p.m., Filellinon 27, 10557 Syntagma.